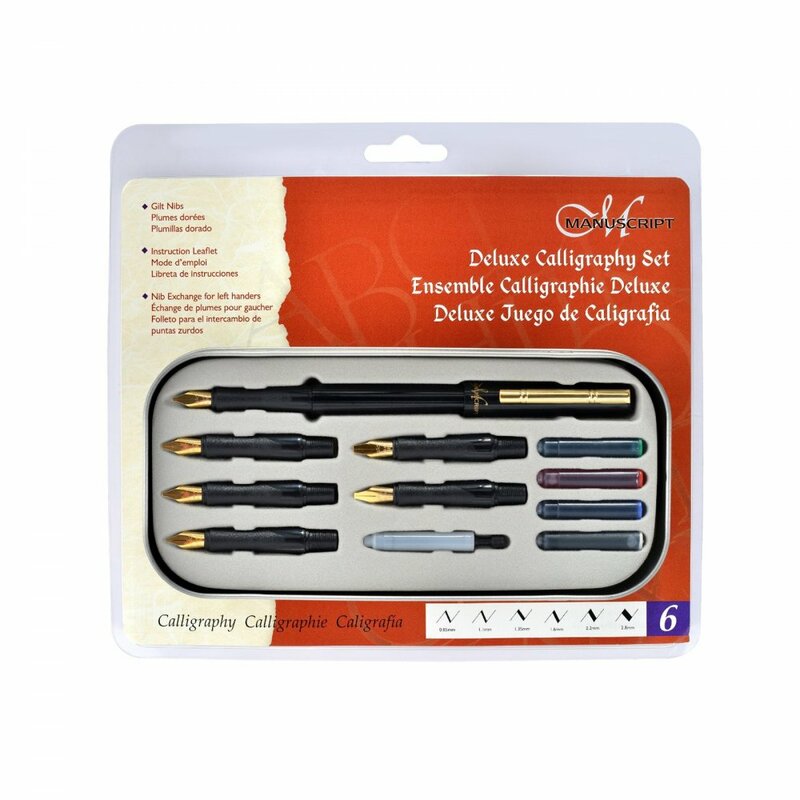 This Manuscript Deluxe Calligraphy Set includes a calligraphy pen, 6 different sized nibs, ink cartridges in assorted colours, and an ink converter allowing you to use bottled ink - all presented in a handy storage box. This Manuscript Calligraphy Deluxe Set is ideal for people who love the beautiful writing craft of calligraphy. This calligraphy pen set is also perfect for adding an elegant, classical touch to your writing, for example when writing cards, invitations, or place cards. The calligraphy set includes 6 different nibs: fine (0.85mm), medium (1.1mm), broad (1.35mm), 2B (1.6mm), 3B (2.2MM), and (4B) 2.8mm. There are also 4 cartridges with black, blue, red and green ink to choose from. The set also comes with a useful instruction leaflet to help get you started. This set is for right-handed people, but left-handed sets are available. The set includes a Nib Service/Order Leaflet if you wish to exchange the right-handed nibs for left-handed nibs.